Born and raised in Buffalo New York, and a graduate of Canisius High School, Danny DiLiberto’s athletic career has spanned an incredible four decades and two sports. DiLiberto started his athletic career as a professional boxer. Trained by Angelo Dundee, the famed trainer of Muhammed Ali and Sugar Ray Leonard, he was undefeated as a Lightweight with a record of 14–0–2 with twelve knockouts, however he was forced into retirement after breaking his hands four times. 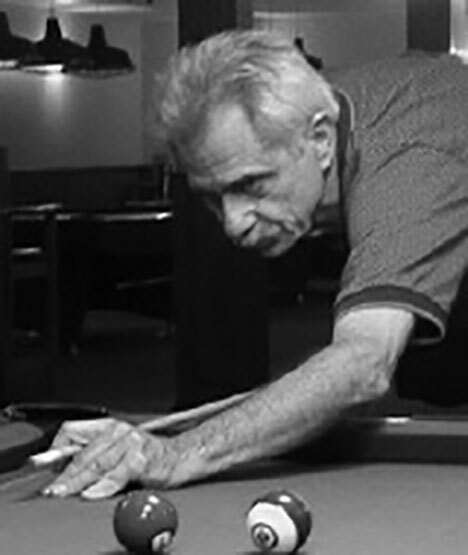 After his successful boxing career ended, DiLiberto made the switch to billiards and over four decades became one of the sport’s most decorated athletes. He began his dominating run in the 1960’s with early wins in the Straight Pool Buffalo City Championship and Straight Pool New York State Championship. Following wins at the local and state level, DiLiberto announced his arrival on the national stage with wins at the U.S. Masters Straight Pool Tournament in 1963 and again in 1969. In 1972 DiLiberto cemented his legacy in Johnson City, Illinois when he claimed victory at the Tournament of Champions and was also crowned the World All Around Champion. His continued success drew the attention of Sports Illustrated, which made him the subject of a lengthy profile in their magazine in 1977. In the 1980’s, DiLiberto’s relentless pursuit of excellence led him to claim five separate championships in various billiard disciplines – The Billiard Congress of America National Eight Ball Tournament (1981); the World One Pocket Tournament Championship (1983); the Classic Cup Nine Ball Tournament (1984), the Eastern States Straight Pool Tournament (1985) and the Western States Nine Ball Tournament Championship (1989). However, he wasn’t done. In the 1990’s, DiLiberto found international success winning the 1997 French Open Nine Ball Tournament and the 1998 French National Nine Ball Tournament. All-told, during his incredible career, DiLiberto won world titles in all four of pool’s major disciplines. Not content with his athletic achievements, DiLiberto authored a book in 2004 entitled You Bet Your Life about his life as a pool player. In 2006 he was the subject of another book titled Road Player: The Danny DiLiberto Story. Ever the over-achiever, Danny managed to become an accomplished bowler in his spare time with a 300 game to his credit. To this day, DiLiberto travels the country as a popular play-by-play commentator for Accu-Stats Video Production, a live-broadcast billiards company. For his accomplishments, DiLiberto is a member of the Billiards Congress of America Hall of Fame, the One Pocket Hall of Fame, the Straight Pool Hall of Fame and the Ring 44 Buffalo Boxing Hall of Fame.